Vertical Velocity V-2 is a roller coaster in Yankee Harbor at Six Flags Great America. While it's not the best, it is also recommended. The minimum height to ride is 54 inches. Strap in and get ready to fly! 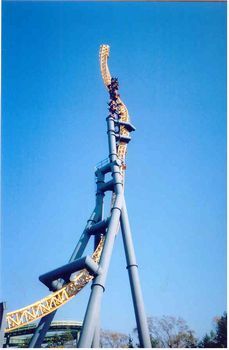 V-2, Vertical Velocity is a suspended spiraling impulse coaster. Launched by an advance-design electromagnetic propulsion system. Riders rocket out of the station at 70 mph in less than 4 seconds. You get shot up a spiraling track only to let you fall back down and be reshot up a straight line of track backwards for a total of 3 forward sprials and 2 backward straights.